Finally some new music that can be heard above the noise! We didn’t think it was possible. We didn’t think there could ever be a new band that could accomplish this feat, but we were wrong. We tried our hardest to compare this band to someone — anyone, and we are thrilled to say that we couldn’t do it! Australia’s Welcome to the Numb is one of the first new rock bands we have heard in a long time that has such an original and unique sound that we can’t just say “they sound like this or that.” And although their name might make you think of Mötley Crüe, we can assure you that this band is nothing like the classic hair band. Weak vocals plague the majority of indie releases we receive for review, so Songs for Sleepwalkers was like a breath of fresh air. With lead singer/guitarist David Jones and singer/guitarist Jake Turner, not only do they have great talent in the vocals section but an important understanding of the use of good vocal harmonies — that alone sets them above the bar talent-wise. Every one of their songs holds a different energy within it, which makes their music so unique. On their debut record, Songs for Sleepwalkers, the first song on the track list is “Walls,” which begins with a cool electronica opening, then Jones coming into the mix seamlessly, singing melodically. Slowly Adam Anderson opens up on electric guitar and Jim Nash brings the drums into the evolving song, changing the energy and vibe to a powerful rock piece, delivering the perfect “wow” factor. Through our stubbornness to try and give the listener a better understanding of what these guys sound like, “Save My Love” has some nu-metal influence within the production, but Jones’s voice once again gives the music a whole new sound. “Taking Me Away” initially made us think of Pink Floyd’s classic, “Welcome to the Machine,” but then the vibe turned into something more likely to be heard in a Nine Inch Nails ballad than a prog epic. “Sister” has a ‘60s folk rock vibe but the song still holds musical elements that make the sound hard to identify. In this song, as with many others on the CD, they do a fantastic job incorporating acoustic guitars, which so many new bands do a horrible job recording. Bravo to their engineer for actually knowing how to record acoustic guitars properly! This Australian band has blown away so many stereotypes as a band itself, but also with the amount of enthusiasm and power they pack into their music. Welcome to the Numb not only doesn’t have any visible flaws to their work, but they raise the bar for what “good music” should be measured against. This is a new band to be reckoned with. It’s a touch ironic that one of our favorite ‘80s bands from Australia, Icehouse, also had songs on their debut record titled “Sisters” and “Walls,” but there’s actually something else this band has in common with that outstanding classic group: a penchant for writing songs with dense musical arrangements, layers of instrumentation and orchestration, and strong vocals with excellent supporting harmonies. Could Dave Jones be the next Iva Davies? Time will tell, but we’re definitely going to look forward to hearing how his band evolves over time. The blues pop revival is upon us! Whether you are at the bar enjoying a whiskey sour, at the local coffee shop with friends or just at home reading the paper, the smooth and bluesy swagger of Tom Principato and his band will make you move to the rhythm of this infectious music. This fantastic guitarist/singer has been playing his Telecaster for audiences around the world for over forty years and has worked with some pretty impressive artists including Eric Clapton, George Harrison, and the Rolling Stones just to name a few. On his latest CD, A Part of Me, he brings his "A" game once again as he uses his strong vocals and smooth guitar solos to bring forth an emotional delivery of music that never ceases to blow new listeners away. The first track on the CD, “Don’t Wanna Do It,” has a Clapton-meets-Santana vibe intertwined with soulful lyrics. There is only one small downfall to this epic album, which is the fact that after a while, the guitar solos just seem to blend together, perhaps having just slightly overdone the familiar blues soloing thing. It felt like the last three songs were just one song divided into three parts (though the last two songs were in fact, two parts of a shared theme). At only forty minutes in length, the CD ends somewhat abruptly; leaving the listener anticipating the start of a song that never arrives. How disappointing for us. Nevertheless, redundant blues soloing does not take enough away from the beauty Tom’s music creates. One of the most important characteristics he expresses through his music is the fact that you can hear how amazing he is but he doesn’t shove that fact into your face. As metal guitarist Zolton Barthory said in a recently MusicPlayers.com interview, “It’s not about if I can play a million notes per second. Of course I can.” The same thing goes for Principato. You can hear throughout each song how talented he is, but he’s modest with his music and uses his talent to bring forth a complete message rather than showing off his chops, which makes him a seasoned talent in our books. Uncle Kracker meets The Goo Goo Dolls in this emulative but enjoyable CD. James Patterson’s novels are considered “beach reads” because the chapters are short, his characters are relatable, and the plots don’t take a lot of brainpower to follow. If that is what defines a beach book, then what defines beach music? Singer/songwriter/guitarist Nate Currin and his band define it with their cheery lyrics about life and love, an eclectic and upbeat sound, and the smooth voices of Nate Currin and his guitarist/vocalist, Simon Peek. Currin’s latest album, Goodnight California, features the song, “Gypsy Girl” which showcases them sounding like a cross between Uncle Kracker and the Goo Goo Dolls. The way Peek “raps” spoken words reminds us a bit of Chester Bennington from Linkin Park. (The music doesn’t sound like them, just the rapping.) The song also gives off the same kind of vibe that Sheryl Crow’s “Soak up the Sun” does, though the lyrics aren’t beach oriented. The best song off the album is “Yellow Springs” because every part of it flows so nicely; beginning with a soft introduction that eventually crescendos into a song of power. The intro starts with a simple guitar and vocal solo by Currin, then Adam Clark comes out with a fantastic beat on drums. Soon we can hear Brent Mayo come in on the Bass to finish this quartet of beautifully emotional and passionate music. In the beginning of “City of Grey” it sounds a little popish and kind of boring until the lyrics, “But oh my God/We’re such a mess/We’ve traded your words/for loneliness,” come out and suddenly the entire song takes on a much deeper meaning. We can’t be critics unless we fine at least one flaw with any band, right? Well, no, but in this case the main flaw with Nate Currin and his band’s music is the fact that though it is beautiful and cheery, it’s all just a bit too similar from one track to another, and sometimes the songs blend into one another (lyrically and musically). Don’t forget to apply sun screen, because this beach fare might lull you to sleep after a bit if you’re not careful. And worse, Currin is painfully emulative of his heroes at times. The opening track, “Dance Away The Night,” is a blatant rip-off of U2’s hit “With or Without You” played at a faster tempo. And no, the next Joshua Tree rip-off in “Lucid Dream” didn’t go unnoticed, either, although he might have been paying tribute to the band, Angels and Airwaves. Though at the times the songs run dry, both performance and production values are excellent. There is no denying the obvious passion Currin has for music. His view of music has always been that. “It is the thing that washes away the dirtiness of life,” and as you listen to his raspy voice and the way he brings his lyrics to life, it is clear that he has picked a team that feels as passionately about music as he does. 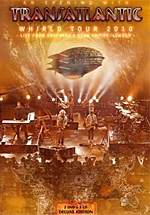 Over three hours of splendid concert performance and hours of behind-the-scenes footage with prog’s preeminent super-group. If you’re a newcomer to the Transatlantic machine, they are a prog rock supergroup featuring vocalist/keyboardist Neal Morse (ex-Spock’s Beard), drummer Mike Portnoy (ex-Dream Theater), bassist Pete Trewavas (Marillion), and guitarist/vocalist Roine Stolt (Flower Kings). Transatlantic’s style is best described as ‘70s style prog rock, with long songs, big organs, vocal harmonies, and lots of layers of sound. It’s a departure from the music produced by the bands from which these fantastic musicians hail. This 2010 London concert was over three hours long and the first DVD (2-disc set) features four songs. That could be a bit misleading, however, since the first song, “The Whirlwind,” is actually the entire current CD, which in the band’s mind is one big, hour-long song. We imagine this was Mike Portnoy’s attempt at humor, which falls short here. If you’re hoping to skip right to your favorite part (err, track) on the record, like “Rose Colored Glasses,” for example, prepare to spend some frustrating time with your remote control’s fast-forward button as the sections of the song aren’t indexed into separate tracks like on the audio CD. The performance is fantastic, and Daniel Gildenlow is added to the band lineup in the utility position, playing additional guitars, keyboards, and percussion as needed. The entire band contributes to vocal harmonies, and we loved hearing Pete Trewavas cover lead vocal duties in parts of the encore performance on disc 2. Want to get to know this band? There’s almost two hours worth of tour behind-the-scenes video footage, shot mostly by Neal and Mike, and a lengthy interview section, too. Also included is video footage of the band performing the early Genesis tune, “The Return of the Giant Hogweed” at a music festival. Appropriately, Steve Hackett makes a guest appearance on that song. This DVD set is the definitive Transatlantic set, and video coverage was well done overall. However, the surround mix was questionable at best. In a home theater setting, the bass guitar was lost, and the mix had a very thin feel to it overall, whereas the two-track mix played through a desktop computer in our studio sounded great. We would suggest turning off your surround sound for best audio results in your home theater. Great resource for young guitar players lacking studio experience. 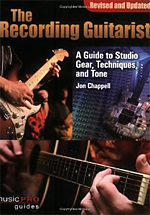 Jon Chappell’s The Recording Guitarist is an informative book that covers a wide variety of topics sure to be of interest to any young guitar player looking to record some guitar. Whether you’re tracking your band’s first demo, a budget do-it-yourself EP, or you’re considering pursuing a career in studio session work, there’s something to address all of these players here. The book discusses differences among various types of electric and acoustic guitars, differences in amplifiers (including a discussion of heads, combos, solid state vs. tube), and then begins exploring the setup for tracking guitars. For the aspiring session player, the discussion of different guitar types is very informative. Everything is covered here, from recording direct to using the built-in Piezos (or not) in your acoustic to miking a speaker cabinet. The chapter dealing with effects focuses on effects placement — in front of the amp, in an effects loop, processing via a bus on the studio desk, and more. There’s even a quiz on “proper” effect placement for “traditional” studio results. There is more information about mixing desks than the average guitar player ever thought he/she needed to know about, but this is great stuff to help a less experienced guitarist understand how signals are routed in the recording studio. We most appreciated the Tips and Tricks section, which covered topics such as capos, delay calculations, how to generate guitar feedback while tracking from the control room, re-amping, and more. The book has a chapter dealing with computer-based recording technology, but as an entire book can be written on the subject, it’s more of a general overview of computer use in practical application as opposed to an analysis of the software products available. While our average reader is probably beyond the scope of this book, there are some useful tips even the seasoned studio guys among us might pick up, but mostly this is a useful book to buy for our kids. Of course, if you’re very new to the whole recording process, then this book is a very easy read that should get you up to speed in time for your band’s breakthrough recording session. It’s a melodic, synthesizer-washed pop dreamscape on Id Guinness’s latest CD, Soul Envy. From the opening track we were hooked. Id’s vocals are dreamy and if you didn’t know better, you might swear that you’re hearing Iva Davies from Icehouse. The odds of hearing two artists in one month that both draw a comparison to the iconic Australian band are staggering, but in this case, the vocals are so reminiscent on tracks like “Three Steps” and “Atlas Drops the Ball” that it’s crazy. But there are also hints of Moby in his voice, with an occasional Chris Isaak moment thrown in for good measure. We would be remorse if we failed to detect Norwegian new wave ‘80s heroes, a-ha, in the music. And the Isaak reference also shows up in some of Durtis Debray’s guitar work when beautiful, clean, guitar tones with tremolo and slide make their appearance. The production is very well mixed, and Guinness is backed by numerous musicians including some acoustic players on violins, mandolin, and double bass. Acoustic drums blend seamlessly with electronic beats and loops on other tracks. Guiness writes songs that could be called pop, new wave, gothic, or progressive depending on your perspective. His fantastic use of melody and vocal harmonies atop lush synthesizers, orchestral players, and your arsenal of rock instrumentation including electric guitars, bass, and drums shows that he is a fantastic talent. He paints a picture with his music, and while it’s all mostly mid-tempo stuff, he keeps the songs short enough and tightly arranged so that you never grow bored. Id Guinness knows how to blend obvious classic influences with modern songwriting and performance and delivers something fresh. If you grew up loving ‘80s new wave or find that classic genre inspiring in your own modern songwriting, this is definitely an album not to be missed. To Guinness, we raise a glass bearing his name this holiday season and give thanks for some refreshing new music that marches to the beat of something different.